Agatha Christie? Bill Vaughan? Anonymous? I think that the famous mystery writer Agatha Christie said something very similar. Would you please help me to find a citation? “And supposing you come up with all the wrong answers?” said Mrs. Oliver. 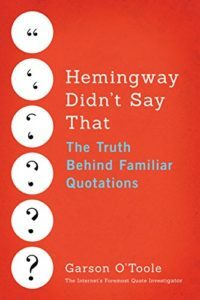 The quip by Bill Vaughan is discussed here. It appeared in April 1969, 2 and Christie’s book was published the same year, but writing a book is often a lengthy endeavor, and QI does not know precisely when Christie composed her computer remark. Thus, the chronology is uncertain. Dear Quote Investigator: I once read a humorous comment about New Year’s Eve that contrasted the experiences of the young and the middle aged. The young were joyful because they were “allowed to stay up late” while the older people held a different opinion. Are you familiar with this joke and its origin?